In my previous blog i mentioned that I would check out that Clonachullion really did mean the ‘Hill of Holly’, well I was only partly correct, it means Meadow of Holly, although an alternative interpretation may suggest that the second part of the word i.e. ‘…chullion’ could come from an Irish source meaning steep unbroken slope, but the reference book I use ‘Place-Names of Northern Ireland, vol 3 County Down III, The Mournes ‘ suggests that when the first part ‘cluain’ is used, and that definitely means meadow, it makes more sense to conclude that it is Meadow of Holly, rather than ‘meadow of the steep slope’ which is a bit of a contradiction in terms, one imagines meadows to be large tracts of flat lush land. Ironically the truth is that Clonachullion hill is rather a steep hill as can be seen from the photo in the previous blog. One interesting feature on this hill and which is visible from Tory bush Cottages are a number of parallel ridges in one of the fields running up the hill. It is my view that these are ‘Lazy Beds’ which were the technique for growing potatoes in this area prior to horse ploughing, and these ridges are still visible as the farming family that created them either died or emigrated as a consequence of the potato famine which lasted from 1845 to 1849. A fuller explanation is given on the cottages website http://www.torybush.com/ and click the Genealogy button . It has been estimated by scholars that the population of Ireland declined by between 20 and 25% as a consequence of the famine, either through death or emigration. It has to be said that the landlords in Ulster, the northern nine counties of Ireland were a lot more caring about their tenants than in other parts of Ireland and offered relief by means of food in return for work. Many of the long rambling walls around the Estates and Demesnes of these landlords were built at that time. Every day at Tory Bush something new or different seems to happen, to-day at short notice we had a group of walkers from Dublin come down from the mountains just to shower and change before travelling back to Dublin by coach. We have never had this type of usage before, and I only got the phone-call last night. Equally on Thursday night I got a call from a youth group in Lisburn that they had been let down by a bicycle hire company and could we provide 13 bicycles for a group of young people aged 13 to 15 on Sat morning at 10.00. Thankfully we were able to help, as in partnership with my son Ronan, we operate a bicycle hire business on the same site as Tory Bush, it did mean a bit of a last minute flurry as though we have quite a few bikes not all are sitting ready to go out on hire, esp. at this time of year and in particular the smaller sizes required by this young group. Ronan was at work all day Friday so it meant we brought the bikes to be used into the large meeting room at Tory Bush, having covered the floor, and Ronan worked on them to about 10.30 pm. We like the bikes to go out in good order and the leader did comment on how well the bikes performed and in particular the gear changing, which is a particularly difficult thing to get right. For some reason this month I have lots of meetings and most business related, perhaps the organisers recognise that Nov. is a quiet month in our type of work and a good time to hold meetings. I don’t think of meetings as work but I guess they are an essential part of operating my business, I will report back on some of them in future blogs. As this is our second blog I am going to try and import a photograph from Tory Bush Cottages. Obviously I have succeeded in importing the photo and whilst not showing the cottages themselves it is still of interest, next time I will preview the photos and select one that shows the cottages in their rural setting. The Granite is a very durable rock and has been used to form the cobbles of numerous English Towns, particularly in Liverpool and Lancashire, perhaps the cobbles of Coronation Street are Mourne Granite. The Plinth of the Albert Memorial in London is made of Mourne Granite. The Diana Memorial in Hyde Park London whilst made of Cornish Granite has a connection with Mourne in that the firm of Stone Masons who built the memorial are from Mourne, McConnell and Sons of Kilkeel cut the memorial from 545 pieces of Cornish granite. Now there is little Granite extraction in Mourne and so McConnell’s are working with stone from all parts of the world with an expertise acquired whilst working Mourne Granite and past down through generations of the one family. Presently they are working with Thassos Marble from northern Greece on a memorial for Richmond Virginia USA. This memorial coincidentally is to replace a previous Marble memorial that has virtually disintegrated as a consequence of atmospheric pollution. Back to the photo, the Mountain in the centre of the skyline is Slieve Meelmore and the hill in front of that is Clonachullion, which I believe means hill of the Holly Trees but I will check that out for the next blog. In the photo of the grounds of Tory Bush there are three things to note, the black Bee hive shaped structure in the bottom right hand corner is a compost maker in which we mix grass cuttings and old cardboard boxes, on their own neither compost well but make ideal compost if mixed. During the summer we generate amazing amounts of grass cuttings at Tory Bush so will have to develop a larger scale means of composting it. We tried adding food waste to the compost makers at Tory Bush but this just attracted rodents so we are looking out for a system specifically for food waste, possibly a wormery. In front of the compost maker in the grass there is a silver manhole cover and this is the lid to one of the two large underground rainwater storage tanks that collect the rain from a number of the buildings at the cottages and is used to supply the Washing Machines for the laundry at Tory Bush. From this it can be gathered that we have strong enviromental principles at Tory Bush but more of that in future blogs. The final thing to note in the photo and perhaps a little mundane is that the garden contains 3 clothes lines, well now it doesn’t, it just has one. Originally the grounds at the cottages were quite open with little defined boundaries, but we recognised that as a weakness, people seemed to prefer there own space so over time we built walls, planted hedges, put on gates etc., to such an extent that people were hesitant to enter this garden to use the clothes lines. We have had to give each house it’s own line. The initial thinking was that we did not want clothes lines spoiling the overall look of the place so they were placed out of view in this garden, but the same cause that gave rise to the requirement for individual clothes lines also provided the solution. The hedge and tree planting we used to give individual house privacy also provided secluded corners were the individual clothes lines could be located. So now from the roadside critical view of the cottages the clothes lines are quite obscured. Hope that last bit not boring, but it typifies a lot of the thinking we put into our actions at the cottages. Today has been eventful, apart from Barack Obama becoming the 44th President of America this is the first day of the Tory Bush Blog. Blogging has been recommended by our web-site designer Andrew Kane of Ardnet as a good means of letting people know about the every day events at Tory Bush. These ‘people’ could be past guests, prospective guests or people who just come across the blog as a consequence of a ‘Google’, or similar, search. 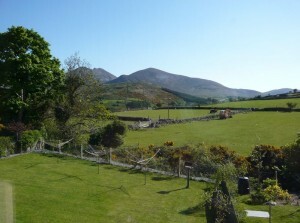 In case you are one of the latter I should explain that Tory Bush are a group of self-catering holiday cottages located in one of the most scenic parts of Northern Ireland, over looking the Mourne Mountains, there is more info on our website www.torybush.com .